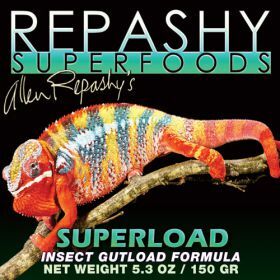 Our Super Concentrated Gutloading Formula increases the Nutritional Value of Feeder Insects.Improved Gel formula now allows it to be used dry, or as a gel. INGREDIENTS: Calcium Carbonate, Alfalfa Leaf Powder, Pea Protein Isolate, Stabilized Rice Bran, Corn Meal, Ground Flaxseed, Dried Brewer’s Yeast, Dried Seaweed Meal, Potato Powder, Locust Bean Gum, Dried Kelp, Dried Watermelon, Rose Hips, Hibiscus Flower, Marigold Flower, Paprika, Turmeric, Citric Acid, Potassium Citrate, Salt, Calcium Propionate and Potassium Sorbate (as preservatives), Magnesium Amino Acid Chelate, Zinc Methionine Hydroxy Analogue Chelate, Manganese Methionine Hydroxy Analogue Chelate, Copper Methionine Hydroxy Analogue Chelate. Vitamins: (L-ascorbyl-2-polyphosphate, Vitamin A Supplement, Vitamin D3 Supplement, Vitamin E Supplement, Niacin, Beta Carotene, Pantothenic Acid, Riboflavin, Pyridoxine Hydrochloride, Thiamine Mononitrate, Folic Acid, Biotin, Vitamin B-12 Supplement, Menadione Sodium Bisulfite Complex). Guaranteed Analysis: Crude Protein min. 16%, Crude Fat min. 5%, Crude Fiber max. 6%, Moisture max. 8%, Ash max. 25%, Calcium min. 9%. DIRECTIONS: Offer to insects in a shallow dish 24-72 hours prior to being used as feed items. As a powder: add to feeding vessel and make sure to also provide a source of hydration. As a Gel: Bring water to a boil on stove, in microwave or kettle. Pour boiling water into a bowl and immediately stir in powder (1 part powder to 2-3 parts water). Let cool or immediately pour into mold. Gel will set at room temperature.